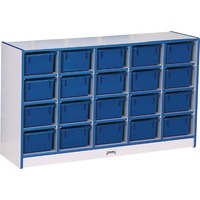 Rainbow Accents Toddler Single Storage JNT0420JCWW007 $524.70 Cubby storage unit encourages an organized classroom. MAXBrackets allow the unit to be moved effortlessly from room to room without causing stress on the wheels and brackets. Wheels are made of hard rubber and won't leave black marks on your floor. Laminate is durable and features an easy to clean surface. TRUEdge is permanently thermo fused to the edges to prevent chipping. Standard Write n Wipe recessed backs can be easily wiped clean.